Wash & husk tomatillos and Serrano peppers. Place on cookie sheet and broil for 5 minutes. Flip over and cook for 5 more minutes. Skin will have slight black blisters. (Don’t be afraid). Pour peppers and tomatillos into food processor. Include all juice that has collected in the cookie sheet. (Note: I like to remove stems, seeds and veins from two of the Serranos to reduce heat. This way all of my family can enjoy). Pulse until it’s a green puree. In Dutch oven, heat 1 tablespoon olive oil. Sear pork 4-5 minutes until golden brown. Flip and brown on other side 4-5 minutes until golden brown. Remove browned pork and set aside. Add chopped onions to Dutch oven. Brown over medium heat until golden, about 7 minutes. Add chopped garlic and cook about 1 more minute. Add tomatillo puree. Cook 5 minutes over medium heat until it thickens and turns a darker green. Stir in water and cilantro. Add 1 teaspoon of salt. Reduce over medium heat for a few minutes until somewhat reduced. Nestle pork in puree. Be sure to pour pork drippings that collect while resting into Dutch oven. Cover and place in 325 degree oven for 35-40 minutes until pork is 145 degrees. While pork is cooking, place red potatoes in pot and just cover them with water. Bring to boil and cook ten minutes or until fork tender. If desired, placed boiled potatoes into pot for last 10 minutes of cooking (Note: I don’t do this for my family, as I have one foodie in the clan that doesn’t like green). Go figure! 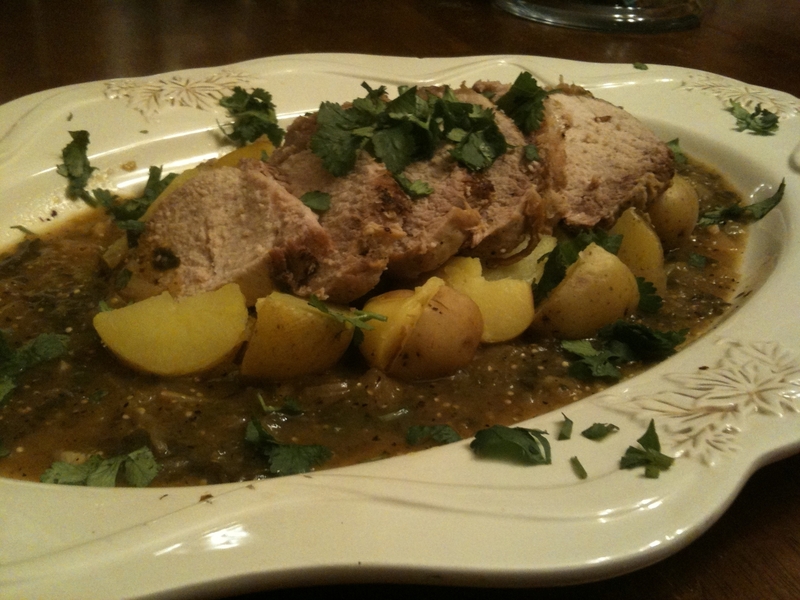 Slice pork into medallions. Serve with red potatoes covered with the sauce. Original recipe found in cookbook, Mexico: One plate at a time, by Rick Bayless. Hi Sue, I tried this recipe and broiling the tomatillos really does make a difference! Of course I’m sure there’ll be another day when I’m in a rush and will just process them without the extra step but for today my family gets the complete sauce. I also found a small pork shoulder roast which I added to the pot with the loin. We’ll see which the family prefers. Thanks for the tip. It’s fun to roast them. Hope it worked for your family. We like the loin but am interested to know what you think of the shoulder roast. Hope your week is wonderful!